The HP Spectre x2 is, no doubt, one of the best Windows tablets ever made. From its hardy performance to its shockingly low starting price for a Intel Core i7 processor, the HP Spectre x2 is a drop-dead beautiful adversary to the Surface Pro, perhaps finally giving Microsoft the push it needs to shake up its design philosophy. Although recent reports would have you believe its time is coming to a close, there’s no denying the influence of Microsoft’s Surface Pro. You could even argue that it’s because of the Surface that we’ve seen an influx of Windows tablets in the past couple of years. So, it makes sense that any one of the Washington-based company’s Windows 10 partners would want to copy such a winning tablet design. Of course, exactly that has happened. Lenovo did it with the Miix 510, Acer’s done it with the Switch 3 – hell, even long-time Android supporter Samsung has recognized game with its Galaxy Book. Now HP is at it. Well, at it again, since this is only latest iteration of the Spectre x2. Previously posited as an affordable alternative to the Surface Pro, it’s now anything but. Starting at an aggressive $1,149 (£1,349, AU$2,299) price point, the HP Spectre x2 intimidates with more than its gorgeous gold-and-black aluminum finish. To be fair, the price of the HP Spectre x2 isn’t too loathsome when you consider the logistics of what you’re paying for. For $1,299, the configuration we reviewed comes stacked with a 2.4GHz Intel Core i7-7560U processor, 8GB of RAM and a capacious 360GB of solid-state (SSD) storage space. Pair those facets with a gorgeous, 3,000 x 2,000 ‘3K2K’ bezel-less display, and you have a more-than-competent slate. 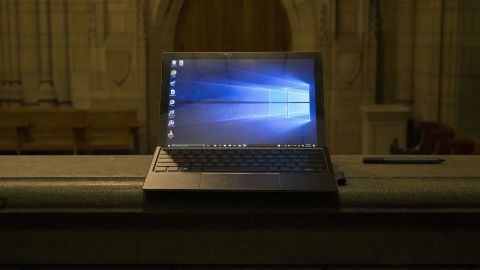 Comparatively, the Surface Pro is $1,599 (£1,549, AU$2,204) for a slightly better 2.5GHz Intel Core i7-7660U, 8GB of RAM, a 256GB SSD and a difficult-to-memorize 2,736 x 1,824 PixelSense display. However, the available HP Spectre x2 models differ ever so subtly in the UK and Australia. In old Blighty, there is only one version of the HP Spectre x2 available, so you better like it. It packs the same i7-7560U chip and 8GB of RAM, but with a distinct 512GB of flash storage and a £1,349 asking price. As of this writing, that also covers a three-year Care Pack for repairs should anything go awry. In Australia, the HP tablet starts at $2,299, albeit sporting merely a 2.2GHz (up to 3.4GHz) i5 CPU and 256GB of SSD space. Otherwise, you can spend a whopping $3,299 for the i7-7560U, 8GB of RAM and 512GB of SSD storage you would find for significantly cheaper in other regions. While the entry-level Surface Pro might appear more enticing at $799 (£799, AU$1,079), that tempting amount nets you the caveat of a mobile-class Intel Core m3-7Y30 processor, 4GB of RAM and 128GB of storage space. Hardly a match for the specs featured in any one of HP’s spectacularly souped-up Spectre x2 models. One of the best parts of owning an HP Spectre x2 is flaunting it at a coffee shop or library. Those familiar with HP’s other offerings will recognize its illuminant appearance from the HP Spectre and Spectre x360 15 before it. The Spectre x2 is no less posh. Trimmed with a gold stand and a chic logo to match, the HP Spectre x2 is a design feat. It certainly doesn’t make the same mistake as the Lenovo Miix 510, a more evident derivation of the Surface Pro, by effectively allowing it to thrive independent from its main tastemaker. It’s a nearly bezel-less beauty that manages to destroy the notion that gold is gaudy. In fact, none of the issues we experienced with the HP Spectre x2 have to do with its design form at all, but rather its function is to blame for the – albeit scarce – technical shortcomings that came our way. The most heartbreaking of these is in the trackpad. Oh, the trackpad. It’s wide and overall functional, but this cursor controller ultimately overstays its welcome. Don’t think about seating this tablet even slightly off the edge of your table or desk. On our review unit at least, the HP Spectre x2 could be audibly and haptically clicked from either side out the trackpad, absent the need to touch it. That’s right, by pressing down beside the trackpad, to its left or its right, the system will still register a click. You can imagine how much of a nuisance this can be when your palms are rested beneath the keyboard. Aside from that, the HP Spectre x2 is a joy to use. The stunning display is noticeably more vivid than that of Microsoft’s laptop replacement, not to mention the aforementioned magnetic keyboard and Active Stylus Pen are bundled in the package. Plus, we have a microSD card slot a headphone jack and two USB-C ports to work with – adapter included. Better yet, there are two cameras on-board here, one to be used as a regular webcam and, the other, an infrared sensor for Windows Hello facial recognition-based logins. The latter worked well in our experience, despite having to reconfigure it periodically whenever the reviewer would remove or replace his glasses. It’s a miracle that the Spectre x2 comes with a stylus at all, yet we have to complain where it’s due. This isn’t the Surface Pen. This is the HP Active Pen, a dual-button writing and drawing tool that supports only 2,048 pressure points of sensitivity, as opposed to the 4,096 of the Surface Pro. Still, 2,048 pressure levels is nothing to scoff at. It’s the same number you could expect from a Wacom Cintiq tablet. Once heralded as the pen tablet to end all pen tablets, however, the Cintiq has fallen behind the times in recent years. So, to say that the HP Spectre x2 shares its sensitivity spec would garner a ‘so what?’ from Microsoft.